For many homeowners, the bedroom is one of the most personal spaces in the house. More than just a place to sleep, most people spend time trying on and changing clothes, hanging out, reading, spending time on the phone and it can often be a place of solitude in the home, away from the noise and chaos of other areas of the house. The bedroom is an intimate and sacred space and it’s important that you make it your own. No other space in the house speaks to an individual’s personality and character more than the bedroom. 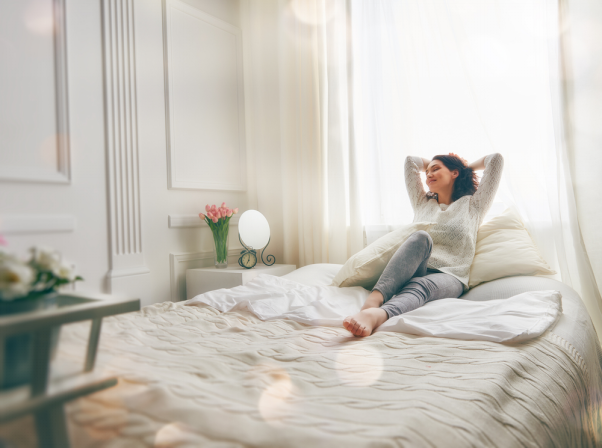 Whether you have leopard print bedding covering memory foam mattresses from Nicklor, or a canopy bed accompanied by velvet curtains and accessories, your bedroom design should incorporate comfort, aesthetics, and practicality. Decorating your bedroom creates an opportunity for you to create a fun, energetic, creative space or alternatively a more subdued, sophisticated, chic area for you to enjoy. Let’s take a look at a few effective ways that you can maximise your bedroom space with ease. The colour on the walls of your room can help to create perspective in the space. Light colours typically brighten a room while dark ones create the illusion of a more cosy space. For this reason, if your room is smaller, brighter colours can make the space look larger. Also, bedrooms that have a lot of windows appear larger, so using dark colours might subdue the intensity of the light that comes into the space. In any event, DIY decorators should play around with colour to give the room some real “pop.” Exchanging drab neutral tones with a variety of colours in the spectrum can help to create both energy and sophistication in the space. In fact, typical colours come in a number of shades, so for example, if you like purple but you do not want purple crayon purple as wall colouring, it comes in a number of shades (both light and dark) that fall in a spectrum of this one colour. Pay attention to the size and shape of the room because DIY decorators can find they can maximise the use of a lot of space. In fact, older homes that contain nooks and other irregular features are opportunities to create unique spaces. Bay windows, for example, offer homeowners the chance to create a comfortable place to read or relax at the end of the day. As stated previously, the bedroom is a private, personal space whose character depends on the person to whom it belongs. For this reason, while you can go into a furniture store and find whole bedroom sets, decorators should mix and match to create a comfortable space. In fact, the size of the room holds great bearing on how much furniture a person can place in a room before it is cramped. For large rooms, decorators have a lot more flexibility. However, for smaller rooms, decorators can play with furnishings. For example, as opposed to the standard large bed and mattress, decorators might find smaller beds frames or mattresses that sit on the floor more appropriate. For a more functional space, consider futons that can fold out as a way to get the most out of your space. Add your personal touch by accessorising the space. Lamps, throw pillows, wall art and tapestries, area rugs, and bedding are just some of the few ways that homeowners can add a personal touch to their homes. When it comes to decorating personal space, this is the one thing that really allows you to make an impression on the space. Designing personal space such as your bedroom can be as simple as organising the space so that the room has the look you want, instead of having to completely redecorate for a new look. Ultimately, the goal is to create a place where whatever you are doing in your bedroom you feel comfortable. As one of the most private spaces in the home, your bedroom encompasses so much of you and it’s important that you do what you can to ensure that you put your own unique stamp on it.